On Wednesday, the Department of City Planning is expected to vote on their proposal to close the voids loophole exploited by developers. The vote, more than four months overdue by their own schedule, is the next step forward, after a March 13th hearing and a review session on March 25th (video). The DCP will vote on the text amendment language they want to pass along to the City Council for discussion and their vote. This means that the DCP could change the proposed amendment on Wednesday–potentially giving developers even more void space– even after local community groups and elected officials have made it clear that this is a loophole that needs to be closed. As originally written, the Zoning Text Amendment sought to control giveaway mechanical spaces by limiting the vertical rise to 25-feet, repeatable after a minimum 75-foot rise of assignable floor area. Read LW! testimony with our recommendations HERE. Even advocates who support the amendment have concerns. The agency’s own findings in an exhaustive study of 796 buildings over a ten year window showed that NONE of those building needed provisions as generous as the 25-foot voids DCP initially proposed. We pointed out that a 12′-14′ tall mechanical floor is more than adequate for flexibility. 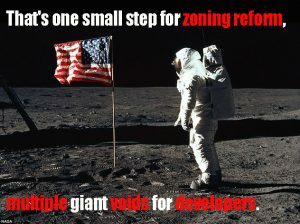 We pointed out that the study’s own findings prove their proposed separation of voids is too frequent. So what did the DCP then propose in their review session? DCP is poised to propose AN EVEN BIGGER giveaway–from 25-foot mechanical spaces-already more than double the void floors in 99% of the buildings they studied–to…yes, 30-FOOT VOIDS! Building filings for 50 W. 66th Street on July 26, 2018 (left) and April 4, 2019 (right) clearly show mechanical void creep (in red). We have seen these tactics before. After the community got wind of a 161-foot mechanical void (sandwiched between two other mechanical floors) planned for 50 West 66th Street, the developer–see above–responded to the backlash by shifting some floors. However, the change actually results in INCREASED MECHANICAL VOLUME while reducing residential floor area. They are playing the numbers game and winning. As communities like the Upper West Side watch with frustration, developers are still going supertall and the DPC is thinking of giving them an even greater piece of the sky. Stay tuned to the LW! WATCH BLOG for word on what DCP passes in Wednesday’s vote and be ready to lean on your City Council representative!